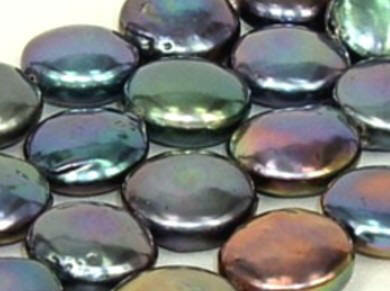 Coin pearls are freshwater pearls. 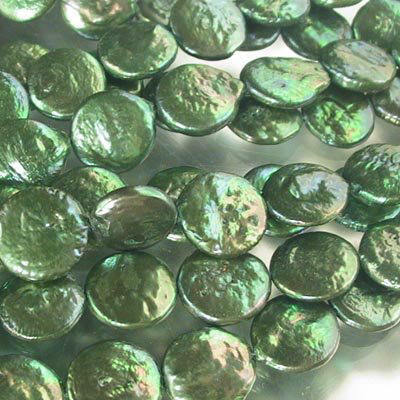 Coin pearls are round flat pearls that look like coins (pearl farmers can even manipulate pearl shapes into other shapes and colors, too). 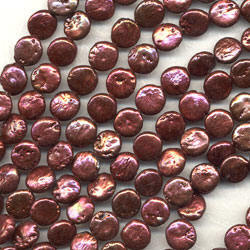 The flat disc shape is very hard to harvest, so coin pearls are more rare and expensive than traditional pearl shapes. 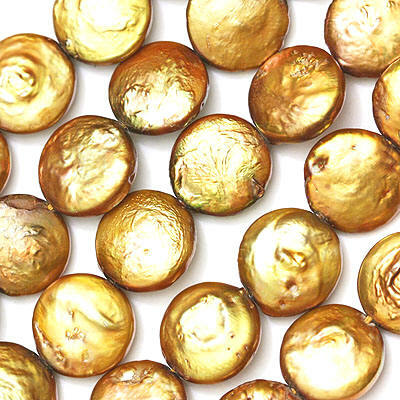 Look at the play of color, natural luster and unique texture of these gorgeous pearls - definitely not your mother's pearls. 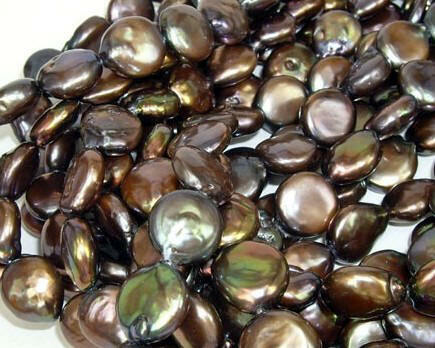 Are you looking for a special color of pearl? Email me - I may be able to find it for you! This is a popular jewelry set for the mother of the bride or the mother of the groom! 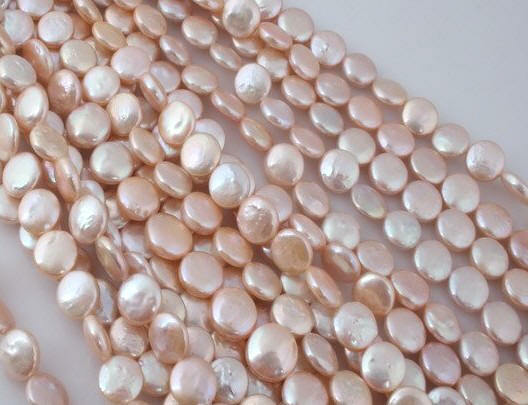 Our coin pearl collection is handcrafted with your choice of white/natural, black/peacock, or pink/peach coin pearls (Do you want a special request color, such as brown, champagne, etc? Just email us.) 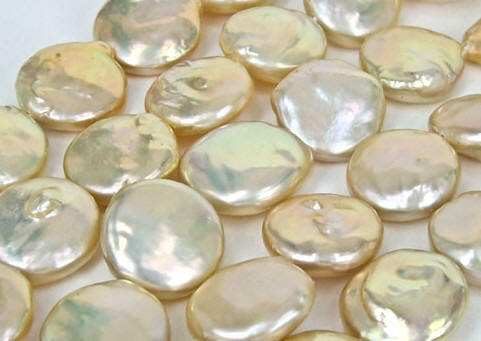 Coin pearls are beautiful - full of interest because of the natural texture of the pearls. The multi-coin pearl necklace is on sterling silver cable chain with a beautiful 11mm sterling silver clasp that has an 8mm cubic zirconia stone in the center. The necklace is approx. 16" long (yes, we can customize the length - email us). There are two side "stations" of coin pearls and cubic zirconia links that frame the front of the necklace. Each side station is approx. 2 1/4" long and has a center 11mm coin pearl, two 5mm sterling silver cubic zirconia links, and two 9mm coin pearls. In the center of the necklace is a dangle, giving the necklace a complimentary look for any bride's gown style and size. The coin pearl dangle in the front in on a sterling silver bail with two cubic zirconia links, a 9mm coin pearl, and an 11mm coin pearl. The front dangle is approx. 2" long, so the total necklace length is approx. 18" long. The multi-coin pearl bracelet is also sterling silver with the same 11mm cubic zirconia clasp that is on the necklace. The bracelet is approx. 7" long (yes, we can customize the length - email us). The bracelet has 11mm, 9mm and sterling silver 5mm cubic zirconia links that match the necklace. The multi-coin pearl earrings are on sterling silver posts and dangle approx. 1 7/8" long. 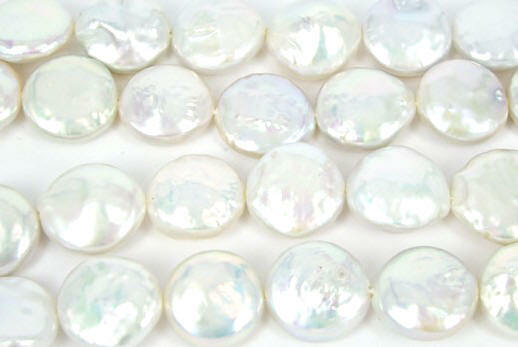 There are two 5mm cubic zirconia stones with 9mm and 11mm dangling coin pearls.